Hello to 2019! Its been two weeks into the New Year and I’ve made some immense changes in my life following the wonderful travel experiences last year which I shared on this blog. I’ve been learning the business side of art. I’ve always known a bit about my art business but now I’m looking at it from a whole different perspective. So I’ve started a new Facebook page just devoted to Creative Paper Collage. I’ve realised that it is my strength and my default artistic practice so I’m embracing it and sharing some of my insights with you. 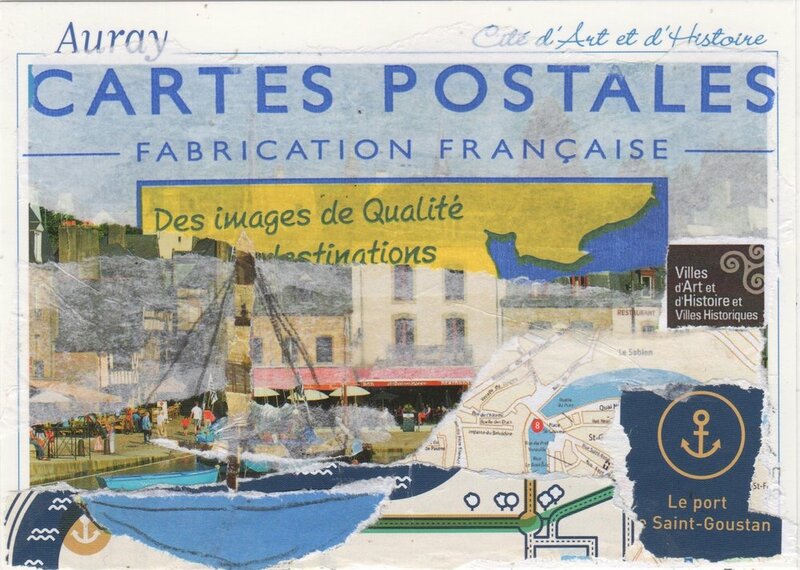 Since I started my new Facebook page this week I showed one of the travel postcards from Brittany and I thought that there were some great stories to share about the creating of these postcards and decided that this year I will share my creative paper collage journey with you on these blogs. 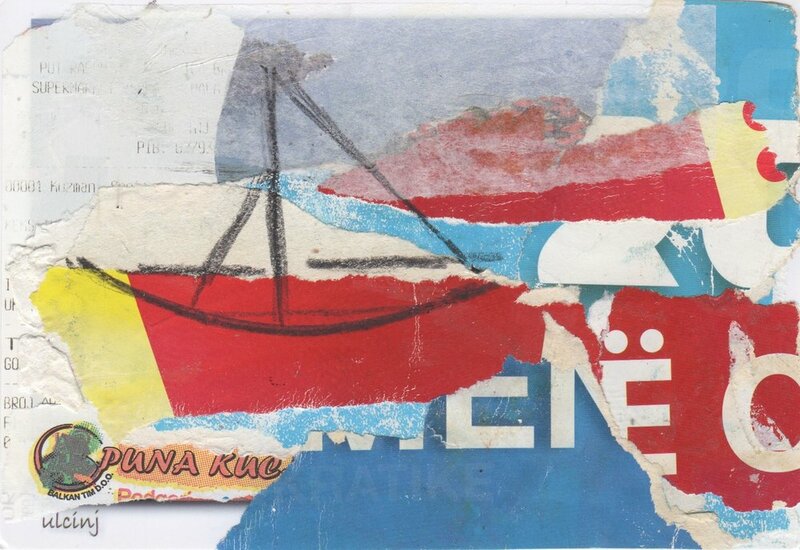 To recap… Last year I travelled for #91 days in Europe and the United Kingdom creating a collaged postcard each day. These cards became not only a travel memoir but used everyday paper ephemera to transform the into artworks each with a story of culture, heritage, language, place and time. Travelling with NO CHECKED BAGGAGE meant there was little room in my backpack for heavy paints, sketchbooks or brushes. Instead I had a glue stick, some old stamps, two water soluble pencils, an ink stamp and a tiny paint brush. It was enough! This experience taught me that collage, like travel is experiential. Each day you start anew with no conceived ideas and adventure with art. I wanted to share some of the stories from those 91 days. I’m going to jump right in and talk about some of my favourite postcards and why I love them and how they take me back to the place and time. This one about Brittany, in Auray. I had forgotten about it but when I went to have coffee at 3sea the little French café in Tweed Heads the other day. I told them how I had a cup of coffee there before I went overseas which inspired me to go to Brittany and to Carnac. I thought Brittany in the north was out range as we were originally going to the south of France before I started my two week residency in Lasalle in the Cevennes. We had missed our flight to Beziers and were stuck in Stansted Airport– that’s the subject of another postcard and another story. Long and short is we ended up in La Rochelle sort of in the centre of the west coast so it was only a days travel up to Auray. We stayed just out of the old town in a lovely little hotel and walked into town along the creek. It was tidal and the tide was out at first. The mud flats bubbled with strange holes and creatures, possibly crabs, which lived there until the frothy waters surged in later that night. The town had a chocolaterie and I spent half an hour in there deciding on what wonderful chocolates to buy. Then I walked around the cobblestone streets just enjoying the shops. I didn’t buy anything but loved the way that everything in the streets was so colourful, pots of flowers everywhere, little fascinations outside shops that made you want to stop and look. The buildings were old, the atmosphere a bit European arty and chic. But the main thing for me was the fact that this was a fishing town. Or it used to be until tourism replaced fishing as the main business. But there were still boats on the river which led out to sea. You could walk along the river all the way. Fish was on the menu and the pub where we stayed for dinner served a great selection. Boats are a potent symbol for me. They speak of travel and of far horizons, of new people and experiences and authentic travel. Travel with purpose, to connect with the elements, to be one with the wind and the sky and the water. Humans have always been migratory - travel is in our ancient lineage. We are survivors. We have travelled to survive -ice age, rising seas, weather, politics, wars, famine, disasters. Today’s mass human migration is one aspect of the longer human story of travel with a purpose – to survive adversity. I think of the demonization our successive governments have done to make it seem a crime to arrive in Australia by boat. But that is how the Europeans first arrived in Australia. Boats are also a symbol of security, life boats and rescue, the biblical story of Noah and his ark. We have an affinity with boats. And so many of my postcards feature boats. Such simple banana shape hulls , a vertical line for a mast and a couple of triangles for sails. A boat to excite the imagination. The boat from Brittany or this one in Ulcinj, Montenegro. Boats that bob in poet Dylan Thomas’s fishingboat-bobbing sea. I love them all!